At Hastings Veterinary Clinic, we’ll help you provide the older cat care your adult pet needs to be healthy, fit, and happy. Our services include preventative treatment programs, surgeries, checkups, and emergency care when required. 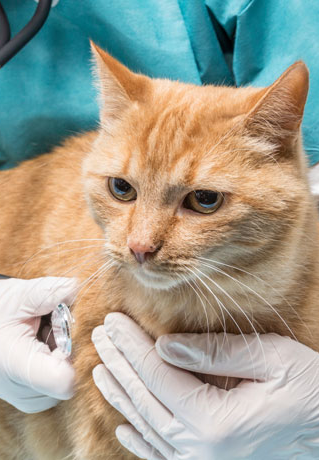 An adult cat (ages 1-7), whether or not he or she is strictly an indoor cat and not exposed to outdoor risks, is still recommended to receive an annual examination. Annual checkups can benefit both you and your cat by catching early signs of illnesses and health problems. Cats of all ages are known for their ability to conceal any physical problems, whether it is pain or illness. Early detection during an examination can often save your pet from any unnecessary suffering, and save you money with early treatment. You will also be asked about his or her behaviour, grooming, and eating habits as well as any concerns you may have. He or she will receive any vaccinations needed, depending on their exposure to other animals and outdoor risks. He or she will be treated for fleas and parasites if any are found. In spite of your best efforts to provide good care, your cat may suffer an accident or develop an illness. If you notice anything abnormal between checkups, please contact the hospital right away. Our staff will assist you with booking an appointment at your earliest convenience. In the case of an accident, please contact our animal hospital as soon as possible. Your cat’s care and comfort is our concern. Whether it is a regular visit, or an illness or accident, we will do everything possible to ensure his or her good health and happiness. To learn more about older cat care for adults and programs for keeping your pet healthy and happy, visit our clinic at: 3995 Hastings Street, Burnaby, BC, V5C 2H8; or phone: 604-291-6666.